Last Tuesday was exciting, but this afternoon was right off the scale! Luckily Mark managed to organise me to apply for tickets on the second go round, and as I was the one who could remember my password I was lucky enough to get four for the team final of the show jumping. Unfortunately Sophie has run out of holiday so Clare, Mark’s sister joined Anna, Mark and I today. We bumped into Shaun Marsh and Michele Hoad from Felbridge Showground at London Bridge Station, so we all had lunch together in Greenwich and then were in our seats in really good time. We were only four rows back, just by the second last fence, so we were really up close and personal! After the first team round Saudi Arabia led on 1 penalty, with Great Britain, the Netherlands, Sweden and Switzerland on four faults, and two fences covering all eight teams in the final. The 21 individual qualifiers jumped first posting only two clear rounds between them so it was clear that Bob Ellis’ course was going to take its toll. 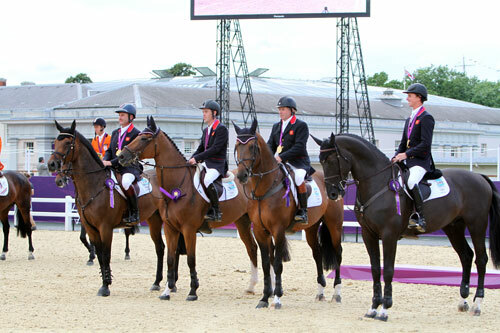 The tension and excitement as Nick Skelton and Big Star entered the arena was almost unbearable – a fantastic clear round keeping both the team and individual dream alive. When Ben Maher and Tripple X just had four faults at the difficult distance across the arena, hopes were dampened, but only Maikel van der Vleuten on Verdi from the Netherlands managed a clear before Scott Brash and Hello Sanctos put us back in the hunt again with an immaculate clear. Our worst possible score was 8 faults, but the Netherlands’ Marc Houtzager and Tamino immediately produced a clear. It was worse than Murray v Federer at Wimbledon – break of serve and immediately break back! By this time the silver medal was in the bag, but when Peter Charles had a fence and a time fault the gold looked just out of reach. However Gerco Schroder and London also had four faults, and we were into a jump-off with the Netherlands for Gold! What an amazing display of horsemanship. Thank you to Nick, Ben, Peter & Scott for wonderful riding, entertainment and your nerves of steel. Thank you to the Widdowsons, Harrises, Phillipses and Olga White for keeping these wonderful horses in the country. Thank you to Bob Ellis for his great courses, and Good Luck to Nick and Ben for the Individual Final on Wednesday. Go Team GB!Jump-off: In came Nick and Big Star and produced not only an immaculate clear, but also what turned out to be the fasted time of the jump-off, followed by Jur Vrieling and a slightly slower clear, then a fabulous clear from Ben, four faults from Maikel – we could nearly touch the gold! Then Hello Sanctos just got on his head a bit and took out a vertical and Marc Houtzager also had four faults – if Peter could go clear? And he did – it was Gold. 60 years since Great Britain last won Gold in the Show Jumping and 28 years since we last won a show jumping medal at all.